About luck. The notion has been irritating me for the past few days. I’ve always been interested in how chance operates in my own life. Like most people, I usually construct a nice satisfying retrospective narrative about my life. But chance has always played an unsettling starring role, throwing a wrench in the aesthetics of that erstwhile smooth story arc—you know, the one where I make wise conscious decisions and directly control the events of my own existence? My sense of the importance of chance has only been heightened in my dissertation research, in observing its importance in the lives of pretty prominent scientists. This is not just the historian’s impartial eye, observing how life deals different hands to different players. This is the witness borne by those players themselves! Renowned biologists—known for their brilliance and not, typically, for their humility—have repeatedly credited chance with the paths of their careers. Paul Ehrlich. Dan Janzen. These guys have taken unusual and sometimes unpopular stances on ecological issues—in other words, they give the impression of deliberately charting their own courses. And yet, Janzen loves the words “serendipity” and “serendipitous,” and applies them liberally to the story of his own career. Of course, when Janzen speaks of “serendipitously” stumbling upon an ant acacia while roving across Costa Rica in the early 1960s, he is not talking about pure chance. He is talking about the convergence of luck and preparation; the effect of a particular experience upon a mind primed with just the right kind of knowledge and previous experiences. The true luck is almost always in the timing of that critical experience. Like Janzen, we’ve been doing some roving across the Costa Rican landscape, hoping for such a lucky convergence. We have no concrete information directing our mushroom search at the moment; only a knowledge of the general rainfall patterns for the season and a sense of where oak trees might be found. Walking along a forest trail during the dry season might remind you of autumn in North America. Deciduous trees lose their leaves here just as they do in the temperate zone—it just happens to be during the “summer,” the drier and sunnier time of year. According to the Costa Rican bird Bible, Skutch and Stiles’ Birds of Costa Rica, it was the Spanish that declared the dry season summer, arriving with their memories of a hot and dry verano and cool and wet invierno. If you’re lucky enough to have made it to an oak-dominated forest, however, you might still look up and see a truly regal canopy above your head. These oaks are closely related to the evergreen live oaks of the Southern U.S. And while “regal” might seem a cliché, under the circumstances, it’s spot-on. The oaks we have seen here are hundreds of years old, many feet in diameter, and verdantly populated with mosses, lichens, and bromeliads. There’s something so vital about the silhouette of an oak tree. The leaves burst so densely from the awkward joints of its branches. Its body looks haphazardly assembled and, at the same time, absolutely coherent. Coherence is a concept, but I would even say that an oak tree is cohesive, in a purely physical sense, as if it is gathering its deep green pigmentation along with moisture and light and a body of cool air, directly from the air around it. When each branch supports a dozen bromeliads, and their bright fuchsia and maroon and yellow-green leaves glowing translucently from above, this sense of pure organic gravity, of substance and sustenance, is intensified. Rhapsodies over the beauty of oak trees, however, do not a successful collecting trip make! Oak trees are also mycorrhizal symbionts, living in intimate collusion with fungi, whose hair-like mycelia connect with their roots underground, sharing nutrients and minerals in an exchange that sustains both tree and fungus. Finding an oak means finding its fungal symbionts, which, if we’re lucky, have fruited above ground, producing those reproductive organs that my dear husband so desperately seeks: mushrooms. This is where serendipity comes in. 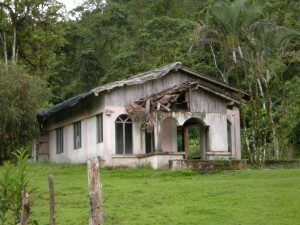 There are thousands of acres of forest reserve and national park in Costa Rica. Most of this is completely inaccessible, or else only moderately accessible, especially for people that need to collect mushrooms, photograph them immaculately, in situ and against a gray background with an herbarium collection number, take DNA samples (because this is, after all, part of a DNA barcoding project), and then dry them completely in a food dehydrator. So, via various points of entry, public, private, and otherwise (meaning, we’re not quite sure who owns the land or the road by which we reach it), we try to get at this inaccessible core of forest. For our purposes then, these roads and trails are essentially random cuts in the forest. We can steer ourselves toward higher altitudes, where oaks and other mycorrhizal tree species are more common, or toward the rainiest provinces, but the decisions made decades ago to build a trail along this ridgeline or blast a switchback for the road into that hillside, may or may not take us precisely where the mushrooms just happen to be fruiting today. As much we have prepared for this trip, there will always be the discomfiting suspicion that somewhere—maybe even just a measly kilometer to the east or the south—the mother lode of mushrooms is elbowing its way up through soil and detritus, where we will never find it. Anyway, that’s how it feels today. Fieldwork, especially when the task is opportunistic collecting in an attempt to document fungal diversity in the region, can sometimes boil down completely to luck. And luck is not with us in other ways, as well. We are three days into this collecting trip and have yet to see the collection and export permits for the mushrooms we are supposed to be collecting. Bryn started the process of applying for these permits more than two months ago, at the moment he knew that his teaching trip would be extended into a collecting trip. Unfortunately however, the term “process” implies that there is a straightforward method for obtaining such permisos. In reality, successfully scoring a permit turns mostly upon finding a reliable contact on the ground, a contact who also has a functional working relationship with the relevant bureaucratic body. It’s not entirely clear what went wrong, but it seems to be a little bit of a failure in both aspects (maybe more heavily the former than the later, I might add). In any case, we have not yet been able to collect in Parque Nacional Tapantí-Macizo de la Muerte, as we do not have the relevant permits. So, we are reduced to making even more random forays into the landscape, in hopes of finding mushrooms on land where park rangers are not likely to be breathing down our necks. This morning, over weak coffee (Costa Rica is a coffee-producing nation that reserves its most drinkable beans for export and tends to disappoint the palate with weak and bitter brews in person. ), Bryn identified a small “protection zone” called Cuenca Rio Tuis, perhaps a couple of hours drive from our hotel in the small village of Orosi. It seemed a little far away, but also unlikely to be heavily monitored, and according to our topographical map, it reaches a peak elevation of 1963 meters and may even have oaks. It was a lovely drive, on a fantastically sunny day, over mountainside roads that rapidly drop and fall while they and around Lake Cachí. 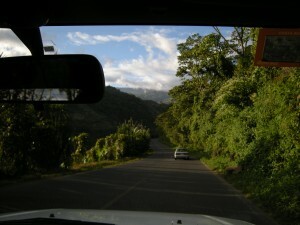 Everywhere that we drove, a brief wave or a “Buenas!” out the window of our car transformed that standard hard-edged impersonal glance you turn toward a strange car into smiles—people are incredibly nice to strange gringos blowing unexpectedly through their tiny little hamlets. 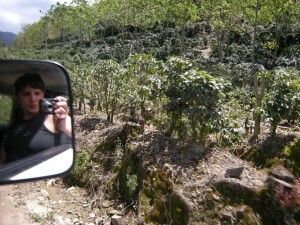 At first, at the higher elevations, we drove through coffee plantations. Coffee is Costa Rica’s grano de oro, “grain of gold,” which brought prosperity to this nation named “rich coast.” Workers alongside the road were spraying the beans with a pesticide. These workers are, reportedly, mostly Nicaraguans, since Costa Ricans are no longer willing to lower themselves to earning something like $1/bushel for picking el grano de oro. The shade-grown varieties actually appear to receive a good deal of sunlight, especially since many of the scattered trees planted to give them shade are deciduous, with only bare branches remaining, which cast crooked shadows (if not actual shade) over the coffee. Other plots are stocked with imported eucalyptus, trees that at least retain their leaves during the dry season. Halfway through the drive we made delicious tomate, aguacate, y queso fresco sandwiches for ourselves at the roadside. At lower elevations we began to see the sugarcane fields, where men with machetes hacked away at their stalks. 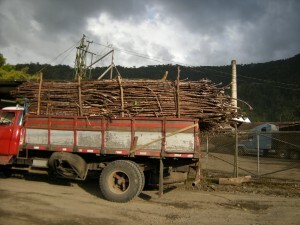 Near the end of the day we passed a plant where trucks full of sugarcane stalks pulled in for processing. The men trailed down the roads slowly in the wake of the trucks, looking exhausted, machetes still in hand, while a smoggy burnt-caramel smoke filled the Orosi valley. Finally we reached our little forest reserve. Or…..we’re pretty sure that we did. After all, most of the roads are not signed and the GPS is often little help in finding our position on what seems to be a pretty imperfect map (it’s missing an entire huge lake?!). Driving into the reserve on the potholed dirt road through increasingly tiny villages (where people seemed even friendlier, in inverse proportion to the size of their towns), we started to get excited about the wooded hills that we could see ahead. When a road winds around so much, you really just have to keep faith that eventually you will reach that mirage of forest on the horizon. We passed a couple of abandoned house, one with half-collapsed porticoes and arches and windows that still contained shards of glass. We’ve tried to decipher graffiti from the side of the building, but it’s hard to read from my passing photograph: “Aqui es solamente / No se aqui que / porque aqui.” Bryn says I’m wasting my time trying to read this nonsense, like a bathroom wall in the basement of some bar in Toronto. It’s something like: “Here is only / I don’t know here what / why here.” Indeed. Anyway, eventually, we had to turn on the 4-wheel drive to cross a little river with steep embankments on either side and a little catarata (waterfall) in the center. But we never got much higher, and we never got much closer to that elusive deep core of forest. We drove as far as we could on the road, to a place where the mud was ridged so deeply in a sharp turn that we couldn’t imagine the car handling both challenges simultaneously. So we did a little bit on foot. And it was disappointing mycologically. But for me, with the mud on my boots, and the humidity that layered my face in sweat the moment I started to climb the steep trail along the hillside, and my first glimpse of something as common as a bird-of-paradise flower—all of these started to melt that icy nucleus of Torontonian slush and snow at my center. Running my hand along a mossy boulder, I had a tempting moment of synesthesia, and I was certain that I could taste the deep green in the blade of a bromeliad just above my head. So, although we struck out mycological today, I feel finally that I have really arrived in Costa Rica, and I’m excited to try our luck again tomorrow. Next → Next post: An example of how much irony you can pack into a story that ends with an iron padlock (plus a pun). Copyright © 2019 Entangled Bank. All Rights Reserved.